Just because Whiskers has a temper, doesn't mean he's a bad cat. Just like humans, cats have different personalities. Some cats are laid back and easy going, while others are feisty and less tolerant. If Whiskers falls in the latter category, learn how to properly deal with him, because incorrect handling might worsen his behavior and leave you with scratches and bite marks. Bring your pet companion to a veterinarian for a full checkup. An undiagnosed illness or medical condition might trigger his temperamental behavior. This can range from a painful ingrown claw or dental condition to thyroid abnormalities, neurological disorders and heart disease. Pet your cat only when he wants to be petted; excessive and rough petting might trigger a mean temper if your feline friend has a short fuse. Keep the petting sessions short and give your cat a treat afterward to reinforce his good behavior. With consistency, he might allow you to pet him longer in anticipation of the treat. Avoid punishing or scolding your cat when his temper flares, because he might start fearing you and his temper might worsen. 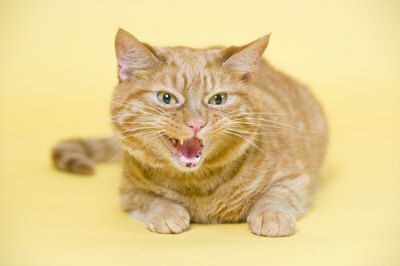 Observe your feisty feline and learn to understand his body language so you can avoid going near him when he doesn't want you to. If your cat is sitting upright with his tail around his legs or if he's resting with his legs tucked in, give him some space, because these postures indicate he wants to be left alone. Consult your veterinarian about neutering your cat. According to the American Society for the Prevention of Cruelty to Animals, adjusting both male and female cats won't affect their personality, but will have a calming effect. Ideally adjusting is done about the age of 8 weeks or before the age of 6 months. Provide your cat with a safe, stress-free, loving environment. Loud noises, kids running around, other animals and even the smell of a dirty litter box can trigger stress and make your pet companion act up. If your cat is a kitten, set up regular play and grooming sessions so he gets used to socializing and being handled and touched. Talk to a veterinarian about your cat's diet, which might be triggering his temperamental behavior. How Early Should Kittens Be Socialized?